The flipside of resilience is burnout, fatigue, malaise, depression, defensiveness and cynicism. Pulley asserts that resilience can be developed by modifying thoughts to broaden personal outlook and adapt to change. The second step is modifying actions based on modified attitudes, beliefs, and concepts. • The Center for Creative Leadership suggests that writing in “learning journals” or “reflection journals” enables reflection, self-awareness, learning, adaptability, and insight. Describe your reaction to the event in factual, objective, quantifiable terms. What did you want to do in response to the event? What did you learn from the event and from your reaction to it? What did the event suggest as a development area? What common reaction patterns occur in similar situations? What different reactions patterns have occurred in the past? What do these different reactions suggest about progress in developing resilience? The Center for Creative Leadership suggests that learning comes “reflecting on the doing,” and not just on the “doing” of specific actions. -*Which of Pulley’s recommendations seem most applicable and feasible to rebound from unbidden changes, like job loss? 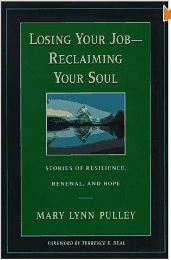 This entry was posted in Behavior Change, Career Development, Resilience, Thinking and tagged Behavior Change, Career Development, Emotional intelligence, Mary Lynn Pulley, Resilience, Thinking, Work-Life on June 6, 2012 by kathrynwelds.